He was born the only child of middle-class bureaucrats (who hoped he would become an economist) on 21 March 1949 in Ljubljana, the capital of Slovenia and, at that time, part of Yugoslavia. Yugoslavia was, then, under the rule of Marshal Tito (1892-1980), one of the more 'liberal' communist countries in the Eastern Bloc, although, as Zizek points out, the freedoms the regime granted its subjects were rather ambivalent, inducing in the population a form of pernicious self-regulation. One aspect of state control that did have a positive effect on Zizek, however, was the law which required film companies to submit to local university archives a copy of every film they wished to distribute. Zizek was, therefore, able to watch every American and European release and establish a firm grasp of the traditions of Hollywood which have served him so well since. Zizek's interest in the films of Hollywood was matched only by a dislike for the films and, particularly, the literature of his own country. Much of Slovenian art was, for him, contaminated by either the ideology of the Communist Party or by a right-wing nationalism. Slovenian poetry specifically is still, according to Zizek, falsely venerated as "the fundamental cornerstone of Slovene society". Consequently, from his teenage years onwards, Zizek devoted himself to reading only literature written in English, particularly detective fiction. Pursuing his own cultural interests, Zizek developed an early taste for philosophy and knew by the age of 17 that he wanted to be a philosopher. Studying at the University of Ljubljana, Zizek published his first book when he was 20 and went on to earn a Bachelor of Arts (philosophy and sociology) in 1971, and then went on to complete a Master of Arts (philosophy) in 1975. The 400-page thesis for the latter degree was entitled "The Theoretical and Practical Relevance of French Structuralism", a work which analysed the growing influence of the French thinkers Jacques Lacan, Jacques Derrida, Julia Kristeva, Claude Lévi-Strauss and Gilles Deleuze. Unfortunately, although Zizek had been promised a job at the university, his thesis was deemed by the officiating panel to be politically suspicious and he therefore lost the job to another candidate who was closer to the party line. According to his fellow Slovenian philosopher Miaden Dolar (b. 1951), the authorities were concerned that the charismatic teaching of Zizek might improperly influence students with his dissident thinking. Disappointed by this rejection of his talents, Zizek spent the next couple of years in the professional wilderness, undertaking his National Service in the Yugoslav army, and supporting his wife and son as best he could by occasionally translating German philosophy. However, in 1977 several of his influential connections secured him a post at the Central Committee of the League of Slovene Communists where, despite his supposedly dissident politics, he occasionally wrote speeches for leading communists and, during the rest of the time, studied philosophy. In these years, Zizek became part of a significant group of Slovenian scholars working on the theories of the French psychoanalyst Jacques Lacan (1901-1981) and with whom he went on to found the Society for Theoretical Psychoanalysis in Ljubljana. This group, among whose best-known members are Dolar and Zizek's second wife Renata Salecl (b. 1962), established editorial control over a journal called Problem! (in which Zizek was not afraid to author bad reviews of his own books, or even to write reviews of books that did not exist), and began to publish a book series called Analecta. Zizek himself is unsure as to why so many Lacanians should have gathered in Ljubljana, but he does point out that, in contrast to the other countries in the former Yugoslavia, there was no established psychoanalytic community to hamper or mitigate their interest in the usually controversial work of the Frenchman.
. Although still disbarred from a traditional university position, in 1979 Zizek's friends procured him a better job as Researcher at the University of Ljubljana's Institute for Sociology. At the time, Zizek thought that this was an intellectual cul-de-sac in which the communist regime placed those who were inconvenient to them. As it transpired, however, this job, which would be the envy of most academics, meant Zizek was able to pursue his research interests free from the pressures of teaching and bureaucracy. It was there that, in 1981, he earned his first Doctor of Arts degree in philosophy. It was also in 1981 that Zizek travelled to Paris for the first time to meet some of the thinkers he had been writing about for so long and writing to - (he has several books by Jacques Derrida, for example, dedicated to him). Although Lacan was chief among these thinkers, he died in 1981 and it was actually Lacan's son-in-law, Jacques-Alain Miller, who was to prove more decisive in Zizek's development. Miller conducted open discussions about Lacan in Paris (and he still does), but he also conducted a more exclusive thirty-student seminar at the Ecole de la Cause Freudienne in which he examined the works of Lacan on a page by page basis. As the only representatives of Eastern Europe, both Zizek and Dolar were invited to join this seminar and it is there that Zizek developed his understanding of the later works of Lacan which still informs his thinking today. Miller also procured a teaching fellowship for Zizek and became his analyst. It was during these analytical sessions with Miller, which often only lasted ten minutes, that Zizek learned the truth of his oft-reported assertion that educated patients report symptoms and dreams appropriate to the type of psychoanalysis they are receiving. The result of Zizek's fabrication was that the sessions with Miller often ended up as a game of intellectual cat-and-mouse. This game ended in something of an impasse when Zizek completed his second Doctor of Arts (this time in psychoanalysis) at the Universite Paris-VIII in 1985. Miller, with whom Zizek had successfully defended his thesis, was the head of a publishing house but he delayed publishing Zizek's dissertation and so Zizek had to resort to a publisher outside the inner circle of Lacanians. This second major disappointment of his professional career threw Zizek back on his own resources. These resources were already being put to more obvious political ends back in Slovenia where Zizek became a regular columnist in a paper called Mladina. Mladina was a platform for the growing democratic opposition to the communist regime, a regime whose power was gradually diminishing throughout the second half of the 1980s in the face of growing political pluralism in both Yugoslavia and the Soviet Union. In 1990, the first democratic elections were held in Slovenia and Zizek stood for a place on the four-man Presidency - he came a narrow fifth. Although he stood as a Liberal Democrat candidate, this position was more strategic than a matter of conviction as he was attempting to defeat the conservative alliance between the nationalists and the ex-communists. Zizek does not, as he has often said, mind getting his political hands dirty. Nor did he mind becoming the Ambassador of Science for the Republic of Slovenia in 1991. Although Zizek continues to provide informal advice to the Slovenian government, his energies over the past decade have been firmly geared towards his research. Indeed, since 1989 and the publication of The Sublime Object of Ideology, Zizek has launched over 15 monographs, and a number of edited works written in English, on an eager public. He has also written books in German, French and Slovene, as well as having his work translated into Dutch, Japanese, Korean, Portuguese, Spanish, Slovak, Serbo-Croatian and Swedish. The prolific intensity of Zizek's written output has been matched by his international success as a lecturer where he has faithfully transcribed the molten energy of the word on the page to the word on the stage across four different continents. Apart from his post at what is now the Institute for Social Sciences at the University of Ljubljana, Zizek has also held positions at SUNY Buffalo; the University of Minnesota, Minneapolis; the Tulane University, New Orleans; the Cardozo Law School, New York; Columbia University, New York; Princeton University; the New School for Social Research, New York; and at the University of Michigan, Ann Arbor since 1991. He also maintains his editorial role for the Analecta series in Slovenia, as well as helping establish Wo es war (a series based on Lacanian psychoanalysis and Marxism) and SIC (a series devoted to Lacanian analyses of culture and politics) in German and English. At all stages in Zizek's life, then, we can detect the insistence of a theme. When he was growing up he preferred the films of Hollywood to the dominant culture of poetry in his own country. As a student he developed an interest in, and wrote about, French philosophy rather than the official communist paradigms of thought. When he began his professional career he preferred to read Lacan in terms of other philosophers rather than adhering to the orthodox Lacanian line. And, as we have seen, as a philosopher himself, he constantly refers to popular culture rather than those topics customarily studied by the subject. In each case, therefore, Zizek's intellectual development has been marked by a distance or heterogeneity to the official culture within which he works. He has always been a stain or point of opacity within the ruling orthodoxy and is never fully integrated by the social or philosophical conventions against which he operates. The point is that although Zizek's unauthorized approach has cost him the chance to become part of the established institutions on at least two occasions (once with his Master's thesis and once with his second Doctorate), he has defined his position only in his resistance to those institutions. This is not necessarily a question of Zizek initiating some kind of academic rebellion, nor even of proving how in the long run his talents have surpassed the obstacles erected against them, but rather of claiming that the character or identity of Zizek's philosophy is predicated upon the failure of the institutions to accomodate his thought. The eventual success of Zizekian theory proceeds partly from its clearly failure, from the fact that Zizek was able to perceive himself as alien to the system in which he worked. It was this alienation, this difference to the discourse of philosophy of which it was and is a part, which forged the identity of Zizek's own thought. Because Zizekian theory was no part of the objective system, it was in itself subjective. The reason that this is so pertinent is that Zizek describes the formation of what is known as the "subject" in a similar way. Indeed, one of Zizek's main contributions to critical theory is his detailed eleboration of the subject. 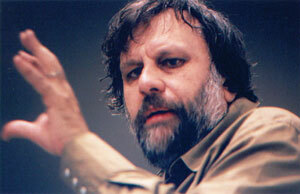 Lacan.com thanks Tony Myers who graciously lent material from his Slavoj Zizek, London: Routledge, 2003.